Have smartphones taken over our lives? Not until we start grocery shopping on our cell phone. 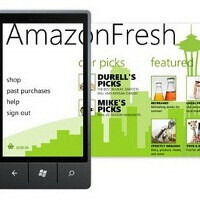 And now Windows Phone can proudly brag about being the first platform to deliver a native application for AmazonFresh, the company's grocery delivery service. There are some limitations though – was it for Seattle's rainy weather or for some other reason, the application is only available in the greater Seattle area, making it interesting to only a limited number of people. Those lucky few however will enjoy same day delivery and a good looking interface. Owners of the iPhone can also order from the retailer's website with similar functionality, but an app is hard to beat in terms of usability. Pair usability with a price tag of zero and we see no reason why you wouldn't want to get the application. Don't rent Death Wish whatever you do. It will ruin this app for you.